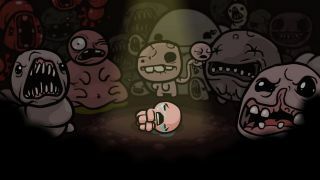 Binding Of Isaac creator Edmund McMillen doesn’t like the word ‘addiction’. But I do. It’s the only word I can use to describe my frankly irrational gaming behaviour over the last seven months. The Binding Of Isaac Rebirth has taken over. I’m more at home in the Basement or the Cellar than I am in my new flat. My thumbs twang with the memory of the repetitive strain injury (RSIsaac) from long winter nights spent firing tears at furious faeces. Versions of the Four Horsemen so noisily disturbing that I heard their cries long after I had switched off the PS4. And don’t even start me on Mega Satan. I won’t stop. One man is to blame and when I speak to him, it suddenly all makes horrible, horrible sense. ”I made this game completely for me,” creator and designer Edmund McMillen quickly admits, having somehow agreed to speak to me about my problem. For those who haven’t had the pleasure, Isaac is the young son of a fanatical Christian single mother who believes after a message from God that she must take the life of her child. He ends up in the basement of their house, battling the demons who reside there with the only weapon he has, his tears. You can see why Nintendo initially said thanks but no thanks. Rooms of living faeces, evil clones, scrabbling spiders and fiendish bosses await. It’s a simple enough set up. Clear the room, the doors unlock, repeat. Permadeath is the order of the day. Each enemy damages you half a heart (initially) and the juggling of items such as bombs, keys and trinkets mean you’ll never play the same game twice. It’s a world of procedurally generated darkness that will drive you slowly mad as you discover how far the demonic rabbit hole actually goes. Spoiler? Far. It goes far. “I think the thing that keeps me coming back is that I play it as well,” ponders McMillen when I ask why he’s still making content and new versions of the game (Rebirth has just released on Xbox One and the New 3DS). “I think also my wife, like you, plays religiously and it’s fun to watch her play. That was one of the reasons why I added co-op so when she was playing I could just pop in and mess around.” This isn’t just a game he created, this is a game McMillen still plays and has updated to suit his tastes. Unfolding is the key to Isaac. Like one of those beautiful Japanese flower teas but with faeces, vomit and dead children. Initially there are only five floors to finish. A descent through the floors (each with its own boss) culminates in a battle with Mom - a stomping, enemy-spawning behemoth with high heels - and beating even that feels like a towering achievement. Dependent on your pick-ups, by that point you can be armed with up to twelve hearts instead of your starting three, have flaming tears, be leaving behind a trail of tar, have a familiar that fires lasers... or perhaps you’ll be steering one giant tear while riding a pony you won from a toxic horseman. Beyond Mom lies two levels of Utero and the chance to defeat Mom’s Heart, a spewing bullet hell of a Boss who spawns laser firing eyes. And then? A chance to ascend to The Cathedral to tackle an angelic version of Isaac himself, or the ability to clamber deeper below and take on Satan. And then? Collecting six pieces of a Polaroid. And then? The transformation of Mom’s Heart into It Lives. Two pieces of a key. The Blue Baby. The Lamb. Mega Satan. The Lost. How deep can you go? How long can you survive with what you’ve got? Be afraid. This game is dangerous. Die and you’re right back at the beginning. Live and you might just watch the credits after one of sixteen endings, roaring triumphantly. “You need the understanding that this game doesn’t play like other games,” explains McMillen. “You’re meant to lose. The excitement is in the next run. Not in the initial. It’s always the next run that you’re excited about because of the possibilities that are endless.” And here’s where the addiction lies. It’s where my thumbs twitch at even the mention of Isaac. Just one more go. Pure addiction. Speaking of forever, McMillen is currently working on the aptly titled Afterbirth DLC, with more items, more bosses, more trinkets, and absolutely no consideration for the thumbs or professional lives of its players. He's been taking feedback from the community too. Enlisting help to add to Isaac’s random arsenal with new items such as Pokeball style throwables that trap enemies for use against foes in another room. But McMillen’s having trouble stopping adding content. Missing? Games? I am missing other games. After the defeat of Mega Satan, I think Isaac can rest for a while. Stay in the dark. There are still some challenges to do, but when Afterbirth arrives, I’ll catch up. Perhaps it’s time to leave the basement and step into the sunshine. Y’know. Just for a little while. Oh, you're just starting? Good luck. You'll need it.